Combining all the luxuries and convenience you could ever want, with all the functionality and durability of a genuine off-grid capable hypercamper the NEW! Reconn R4 is a true adventurer. 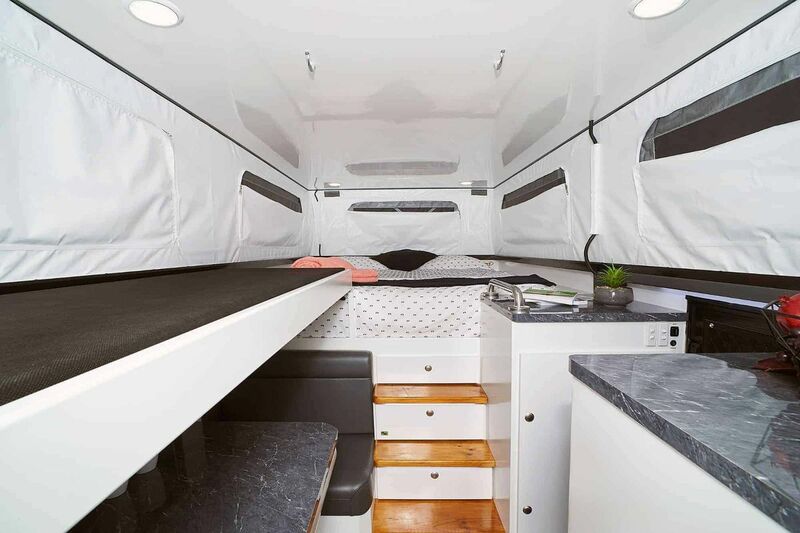 Australian designed and manufactured, this latest offering from Lifestyle Camper Trailers is the result of innovative planning and continued evolution in its range of heavy duty off-roadable hypercampers. Built to tackle any landscape or terrain, the NEW! Reconn R4 packs a punch with its sleek yet tough exterior and a huge list of inclusions as standard. From sandy dunes to tough outback tracks or a quick getaway to your favourite caravan park, the Reconn R4 is ready to take on whatever challenge you throw its way. 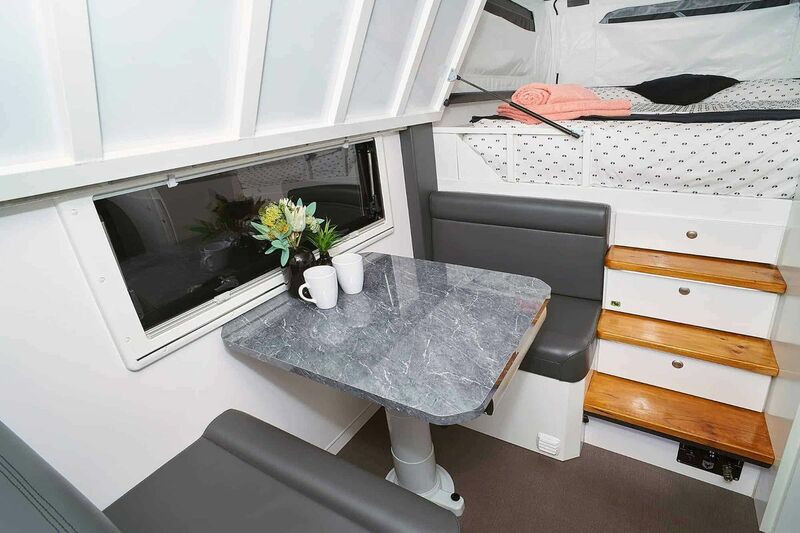 Available as a 2, 3 or 4 berth and with 4 different configurations – be it a café dinette (as shown in pictures), a lounge layout, folding bunk or a convertible dinette to bunk layout – each configuration comes standard with a separate toilet and shower, giving you a range of options from which to choose from. 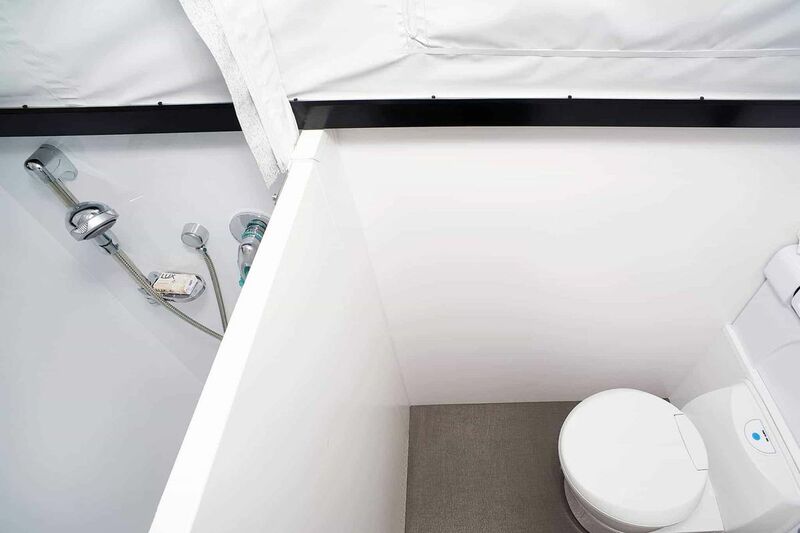 Optional folding bunk layout sleeps up to 4 people. 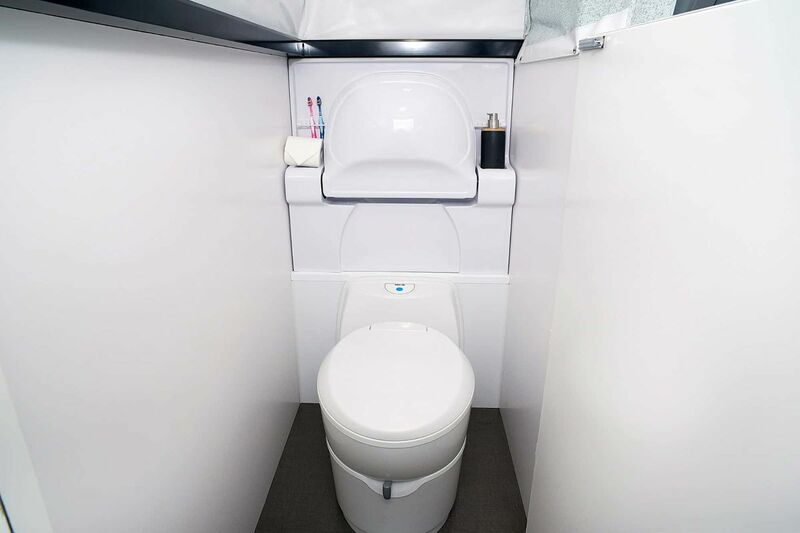 All Reconn R4 layout configurations come standard with a separate toilet and shower. And setup has never been quicker or more convenient than in the NEW! Reconn R4. With the simple push of a button, automatic DC actuators will have your roof up in no time and the handy wind out awning means you’ll be sitting back, enjoying a cold drink around the fire quicker than ever before. The galvanised steel chassis frame, Cruisemaster XT coil spring independent trailling arm suspension with 4x shock absorbers and 12” electric brakes ensure a comfortable yet resilient ride, ready to tackle any road and weather conditions. A roof mounted 150 watt solar panel along with 2x 120 A/H AGM deep cycle batteries and a REDARC Battery Management System gives you the independence to truly go off-grid without having to worry about shortage of power to your camper and included accessories. Plus, with a high quality inline water filter, Truma 14L gas hot water system, 3x 90L heavy duty poly tanks, a flow gauge and 12v marine grade high pressure water pump you’ll have access to plenty of water wherever your adventures might take you. As for cooking on the road… well it’s never been more elegant than in a Reconn R4. 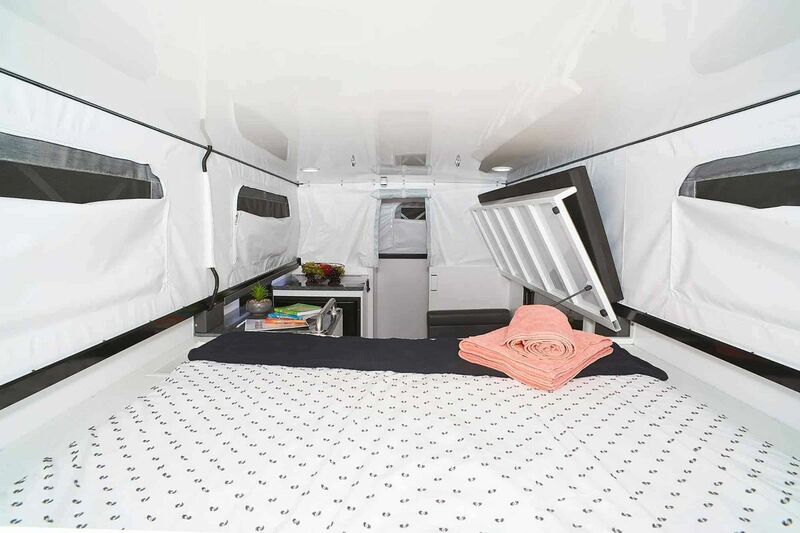 The deluxe external kitchen with its array of cupboards, 2 burner gas cook top with folding glass cover and stainless steel sink with flick mixer tap provides you with all the tools you need to whip up a truly 1st class camp meal. 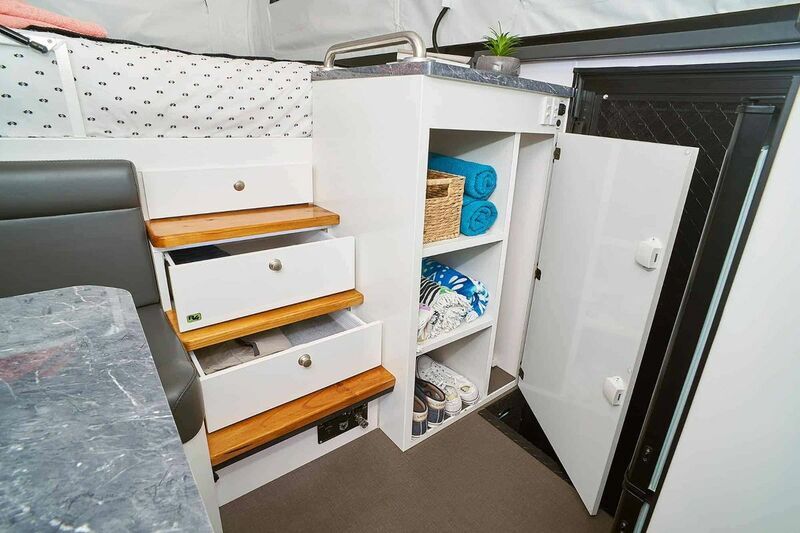 Huge, well designed storage areas both inside and outside, the Reconn R4 has room for all your camping essentials and much much more. Step in to the lavish interior through a large entry door and onto the innovative stairwell and you’ll be amazed at the space and attention to detail in the interior of the Reconn R4. 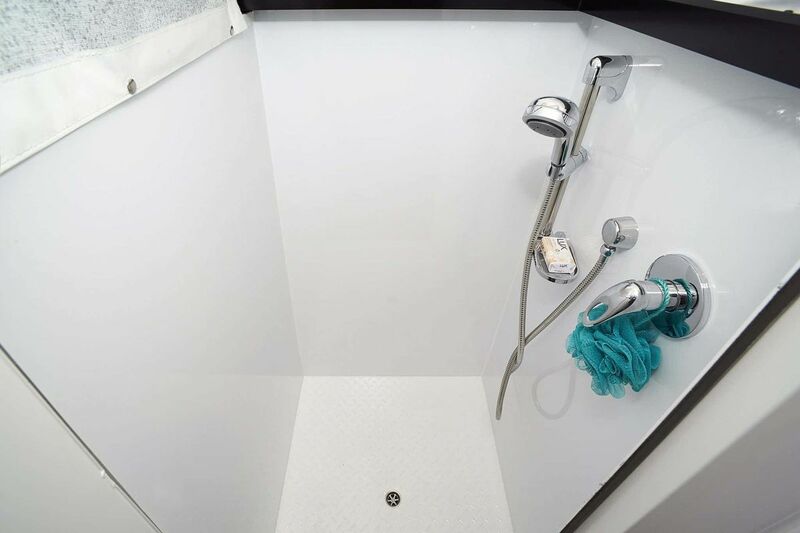 Freshen up in the privacy of your very own ensuite with an internal shower, separate toilet and sink as standard. Grab a well-deserved drink from your EvaKool 145L 2 door 12volt compressor fridge/freezer and settle in to the comfortable dinette (or lounge depending on your preferred layout) for a bit of a relax. Then ascend the 4 beautifully crafted floating, backlit stairs which guide the way to a well-appointed queen size inner spring mattress with pillow top so you can rest easy after a long day out exploring. 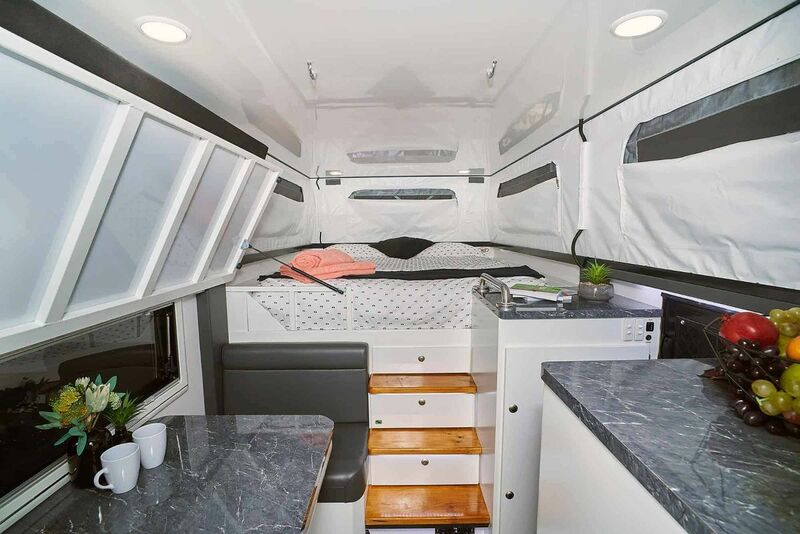 With its genuinely state-of-the-art design and outstanding inclusions, the Reconn R4 really is the solution to all your off road and camping adventure dreams. But seeing truly is believing – so be sure to come and explore it for yourself at one of our upcoming shows or make an appointment to view it in our Brisbane Showroom.